Have you ever wondered why so many books, films and stories seem similar? This is due to an age old story structure that has been used for thousands of years from Homer’s Odyssey to Bob Dylan songs. Joseph Campbell gave this story form a name in the late 1940s: The Hero’s Journey. The structure he proposed has been recognised, studied and used even more ever since. One person inspired by these ideas was a young filmmaker called George Lucas; he made The Hero’s Journey central to a few films you might have seen. 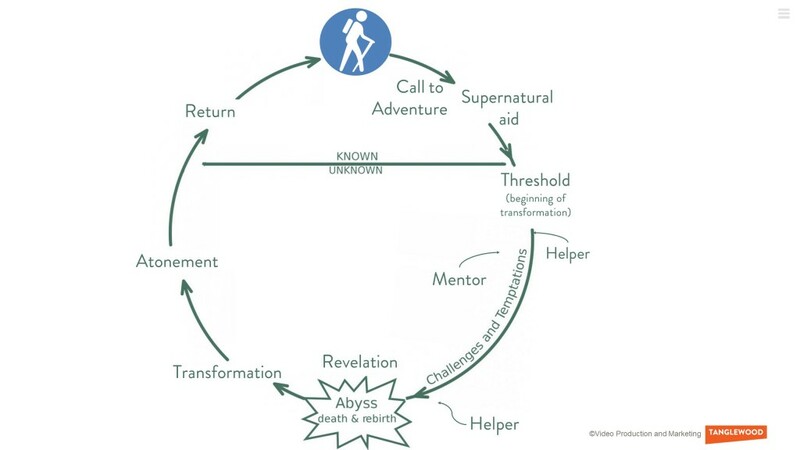 Let’s have a look at Campbell’s structure of the Hero’s Journey more closely. The Hero who is usually a regular guy or gal so the audience can relate to them, hears a call to adventure, perhaps they’re restless or find a new world they weren’t aware of. Often they are reluctant and try not to accept. Due to an often supernatural event, or a herald character they are persuaded to go on the adventure. Crossing the threshold, hero moves out of their comfort zone. Followed by a huge abyss, things are looking bad, nearly gives up, someone might die here, or friends abandon them. Then they cross the threshold home and everyone is happy, but they have been changed by the experience. The Hero’s Journey distils storytelling down to its purest form. Stories are in our blood, they are how societies have passed their customs, societal codes and history down the generations for 1,000s of years. That’s why stories can be so powerful: if they contain the right archetypal figures, events and motifs that we’ll recognise from the stories we’ve been hearing and telling all our lives, we feel a connection that resonates at a deep level. And film is the most efficient way of telling stories. The viewer doesn’t need to imagine the scene or fill in any blanks, the information we’re imparting can move directly into the subconscious. Have you ever wondered why your dreams look like movies? In fact, it’s the other way around. Film didn’t evolve into its current form accident – it follows the pattern of our dreams. That is why film & video are so powerful to humans, they speak directly to our subconscious, animal minds. If stories are the method of delivery, the syringe if you will, then archetypes are the tools, or the big fat needle on the end of the syringe. The word archetype derives, via many twists and turns (but that’s another story…), from the Ancient Greek terms arch?, meaning “beginning or origin” and tupos, which can mean “pattern” “model” or “type.” So you could take it to mean “original pattern,” or the Platonic ideal of a character, object or event. That is to say, archetypes deal with underlying shared characteristics rather than the specific peculiarities of an individual person, object or event. They’re “types” of person or stories that we have in the back of our head and use as a sort of filing system to quickly identify new characters or stories without really thinking about it. Here are some examples of common archetypes. They are not always distinct personalities, often a character will be a combination of different archetypes. There are also other archetypes that are not on this list. How can these ideas help with video marketing? So why am I banging on about all this? We’ve all seen marketing budgets migrate from TV and print to online because that’s where the audiences are. And how are audiences consuming content? Mostly as video – and this tendency will only increase over the next few years (stat). The trouble is online video viewers are very fickle. Quite right too! Why should anyone volunteer to waste precious time watching something salesy, cheesy or, sadly most common: just boring. People decide whether they’re going to watch a video within the first 10 seconds – and even if they stick it out, you’re only likely to have their attention for around 60-90 seconds. So you have to get your message across as quickly and efficiently as possible. And that’s where archetypes come in. Because they hit us where we live (whether we realise it or not), they can be used as a short-cut, a short-hand that your audience will instantly recognise, and which will resonate with them on an emotional level. 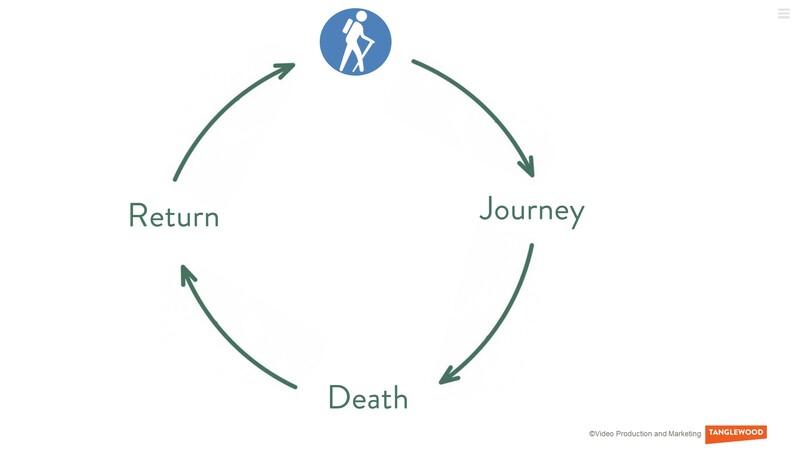 The anthropologist Lévi-Strauss condensed the Hero’s Journey down to just 3 stages: Journey- Death- Return. It still works, that’s the beauty of these tools, just a hint can get your point across. What better demonstration of how to condense a story into it’s elements than Vine, Twitter’s 6 second video platform. Remember when watching these to look out for the 3 stages Journey, death, return (death doesn’t always mean literal death, but just a low point of the story). Contrary to popular belief, video marketing isn’t just about creating viral videos. There are different goals depending on what you want to achieve. 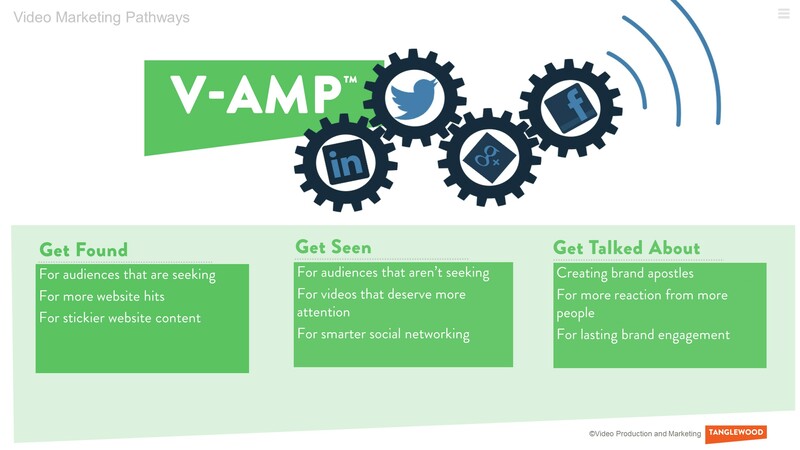 In conjunction with our partners at V-AMP, the video marketing engine, we’ve identified three key pathways you should be following to make video work harder for you: Get Found, Get Seen, and Get Talked About. To Get found, you use video content to drive customers to your website and stay there longer. To Get Seen you need social media to promote your video content. And to Get Talked About, you must start to engage with communities to create a buzz around your campaign and get people sharing your content, i.e. become your brand apostles. Each route uses a different set of tools for a different outcome. But whatever techniques you use and whatever your campaign goals, tapping into the power of archetypes can help your message resonate. The silicon Valley CEOs are trying to go for the regular guy archetype when they talk to camera about their philosophy dressed in a t-shirt and shorts. It’s the “I’m a regular guy just like you despite having a personal net worth of over a gagillian dollars” archetype, which we’re all so familiar with now. A business video on the about us page should follow the hero’s journey. Volvo: Epic Splits – Hero/warrior archetype. Why do people share videos? That’s a massive subject, and there’s more in V-AMP’s white paper on the subject (coming soon), but essentially it boils down to social currency. People share to make themselves look cool, look caring or look intelligent to their peers. All of which can be accessed using archetypes. 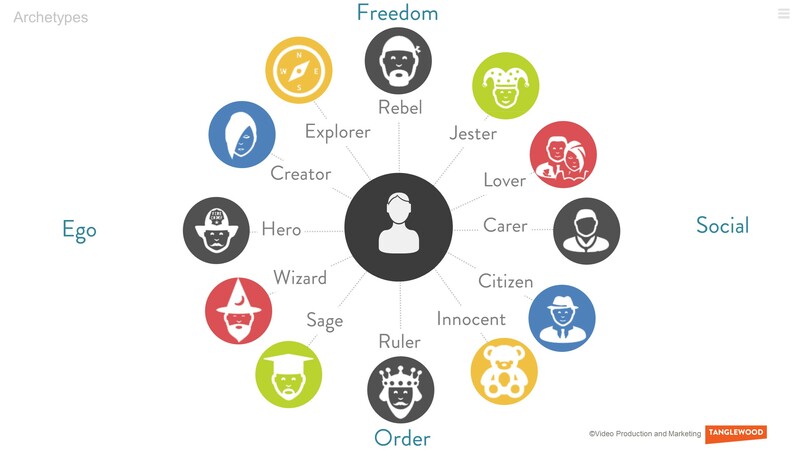 How How to incorporate archetypes into your video campaign. You don’t need to go hunting around for brand-new ideas to harness a little of the magic of archetypes for your own campaigns. The chances are, if you understand your brand, product or service well enough, and what it can do for your target audience, you’ll have the basic work in place already. You just need to work out which archetypes are the closest match to your story, or which your customers will identify with most. When it comes to video content, always start from the viewer. 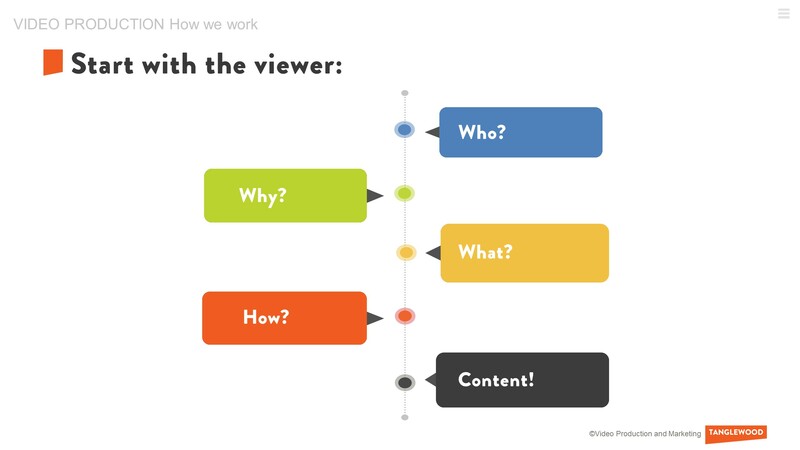 When planning video content, always start with what you would like the video to achieve or in other words, what would you like the viewer to do after watching the video. In some cases it might be a simple brand awareness exercise, so you want the viewer to remember the brand. In other cases you want people to share content, sometimes it might be to donate, like a facebook page, whatever it is, this should be the starting point of the campaign as it informs, style, content and strategy of what to do with video once it’s made. iv. How are you going to encourage them to it? 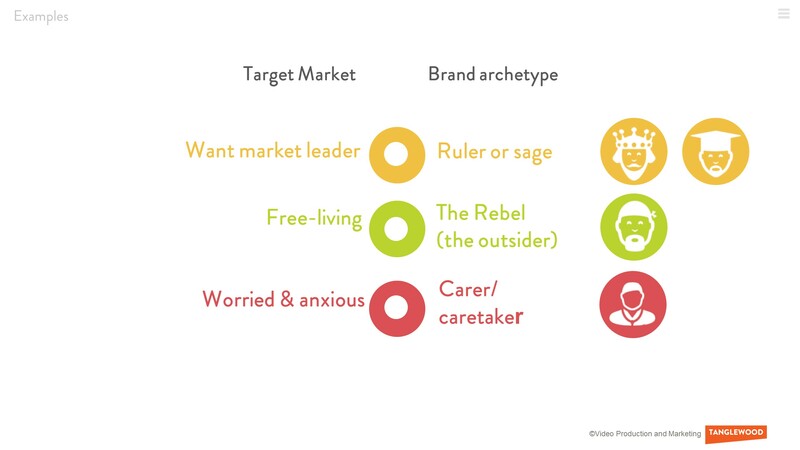 Choose your archetypes, based on your brand’s character, and most importantly, what will resonate with your specific target market. If you’re trying to attract a target audience that sees themselves as free-living, above-the-herd individuals, especially if in real life they tend to be affluent, with perhaps boring jobs or lifestyles, then hit them with The Outsider (that’s Apple again, especially a few years ago, or Freelander), possibly twinned with The Creator. And if your audience tends to be anxious or worried about what others will think, especially in everyday products like food, The Caretaker will help reassure them that they’re showing love and doing the right thing by using your product. Think of 3 or 4 key descriptive words that describe the archetype that you’d like to project. Start thinking how those words can be portrayed within your content. Think of existing stories and characters that you can use or subvert or deconstruct to rebuild within your own framework. Brands and businesses large and small need to be using stories now more than ever before. In the digital, social space it is good stories that are connecting to audiences. And if you’re going to tell stories, then you need the right tools for the job, archetypes and archetypal structures like the hero’s journey. 1. “Cisco Visual Networking Index: Forecast and Methodology, 2013–2018.”Cisco. <http://www.cisco.com/c/en/us/solutions/collateral/service-provider/ip-ngn-ip-next-generation-network/white_paper_c11-481360.html>. 2. “Digital Advertising Benchmarks.” MarketingProfs. <http://www.marketingprofs.com/charts/2014/24821/digital-ad-benchmarks-performance-by-format>. 3. “Invodo Video Statistics.” Invodo. <http://www.invodo.com/resources/statistics/>. 4. “Nate Elliott’s Blog.” The Easiest Way to a First-Page Ranking on Google. <http://blogs.forrester.com/interactive_marketing/2009/01/the-easiestway.html>.